Kalburgi is a town and 613 km north of Bangalore and well connected by road to Bijapur, Hyderabad, Solapur and Bidar. A railway line connecting the southern part of India to Mumbai and Delhi passes through Kalburgi. The city of Gulbarga was founded by the Bahmani Sultans in the 14th century as thier capital. However the history of the region dates back to the 6th century when the Rashtrakutas gained control over the area, but the Chalukyas regained their domain and reigned for over two hundred years. The Kalachuri who succeeded them ruled till the 12th century. Around the close of the 12th century the Yadavas of Devagiri and the Hoysalas of Halebidu took control of the district. About the same period the Kakatiya dynasty kings of Warangal came into prominence. The present Gulbarga District and Raichur District formed part of their domain. The Kakatiya power was subdued in 1321, and the northern Deccan, including the district of Gulbarga, passed under the control of the Muslim Sultanate of Delhi. The revolt of the Muslim officers appointed from Delhi resulted in founding of the Bahmani Sultanate in 1347 by Hassan Gangu, who chose Gulbarga to be his capital. When the Bahmani dynasty came to an end, the kingdom broke up into the five independent Deccan sultanates, Bijapur, Bidar, Berar, Ahmednagar and Golconda. The present Gulbarga district came partly under Bidar and partly under Bijapur. With the conquest of the Deccan by Aurangezeb in the 17th Century, control of Gulbarga passed to the Mughal Empire. In the early part of the 18th Century, when Mughal Empire was declining, Asaf Jah I, a general of Aurangzeb, became independent and formed state of Hyderabad in which a major part of Gulbarga area was also included. The city flourished during the rule of Nizams. Modern buildings were built, Roads and Railways were laid, the city was beautified with gardens, Electricity was introduced, Modern admininstrative setup was laid, Educational institutions were established, Factories namely MSK Mills and Shahbad Factory were established etc. Testimony to which is the only surviving garden (Mehboob Gulshan: named after Nizam VI - Mehboob Ali Pasha) and most of the Government buildings that were built during that time. The city, district and division was ruled by a very cultured, Intellectual and elite bureaucracy. In 1948 Hyderabad state was annexed to the newly-independent Indian Union, and in 1956 the Indian state of Hyderabad was partitioned among neighboring states along linguistic lines. Most of Gulbarga district became part of Mysore state, later renamed Karnataka, excluding two taluks which were annexed to Andhra Pradesh. Gulbarga has 10 Talukas, they are Aland, Gulbarga, Sedam, Afzalfur, Shahapur, Chincholi, Yadagiri, Jewargi, Surapur and Chittapur. Gulbarga district is border of Maharastra and Andra Pradesh. Gulbarga's old moated fort is in a much deteriorated state, but it has a number of interesting buildings inside including the Jama Masjid, reputed to have been built by a Moorish architect during the late 14th or early 15th century who imitated the great mosque in Cordoba, Spain. The mosque is unique in India, with a huge dome covering the whole area, four smaller ones at the corners, and 75 smaller still all the way around. The fort itself has 15 towers. Gulbarga also has a number of imposing tombs of Bahmani kings, a shrine to an important Muslim saint, Sharana Basaveshwara Temple ,Sri Sai baba temple, Sri Ram Mandir and Sri Bhavani shankar temple(Sri Sadashiv maharaj). Shorapur Fort, Taylor Manzil, etc. 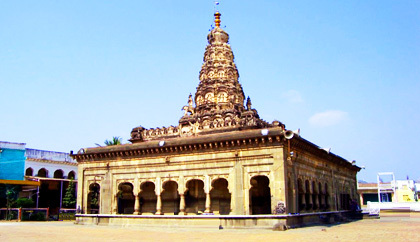 Sharana Basaveshwara Temple is a shrine at Kalburgi (Gulbarga), an ancient town in the north-eastern part of Karnataka. 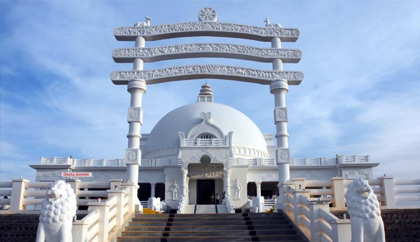 The temple is dedicated to an eminent Hindu religious teacher and philosopher, Shri Sharana Basaveshwara,a Lingayat saint of the 18th century known for his Dasoha (Giving is earning) and Kayaka - an advancement of the Karma doctrine "You have the right to perform the work assigned to you. You have no rights to 'demand' the fruits of your labor" philoshophy. The temple houses the Samadhi of Sharana Basaveshwara at the center called the garbha gudi. It has a lake adjacent to it which attracts many devotees and tourists. It also has a lake adjacent to it which attracts many devotees and tourists. People from across the country and abroad cutting across communal lines will converge on the sprawling temple complex to witness the historic car festival.On the occasion, the people will also have a glimpse of the silver plate (Prasada Battala) used by the saint.The Prasada Battala, which is displayed once in a year during the car festival, would be shown to the devotees.Along with the Prasada Battala, the devotees will get a chance to have a look at the Linga Sajjike (the cover used for keeping the Linga) made in Sandalwood and used by Sharanabasaveshwara.people, particularly farmers from the region, continue the practice of donating a portion of their harvest to the temple for providing free food to pilgrims visiting the temple.